Most buildings in Boulder can be more comfortable, healthy, and efficient, but where is the best place to start? The GB3 Energy Audit provides you with objective analysis to answer that question for your property in Boulder. We take pride in our work and treat your home or building and its challenges like our own. All of our auditors are certified by the Building Performance Institute (BPI) and have extensive experience assessing building performance. Our goal is to provide you with objective data and cost-effective solutions so that you can make decisions about improving the comfort, health and energy efficiency of your home or business in Boulder. The cost for the Energy Audit is $600, after Xcel Energy rebate. We request one year of your Boulder property’s utility bill information from your utility provider before we arrive for your audit. This hard data gives us a baseline for your building's current performance and energy consumption. The first step with all of our clients is to learn about their building. When we arrive at your Boulder building we will ask you about your building’s performance, problem areas, current utility bills, future plans for the building, and building performance topics you want to learn more about. We take note of your lights and major appliances in order to provide you with energy savings recommendations. The blower door is one of our most powerful tools. It allows us to locate and quantify air leakage. Reducing air leakage is one of the most effective ways to improve your building’s energy efficiency. Our audit includes an inspection and evaluation of your Boulder building’s current insulation levels in walls, attics, vaults, cantilevers, basements, crawlspaces, and anywhere else insulation should be. We make sure insulation is installed correctly and has a proper air barrier covering. Using one of the latest infra-red cameras designed for building energy testing, we can literally “see” the thermal difference caused by air movement and missing insulation. Our infra-red camera allows us to identify problem areas no other test can determine..
GB3 will assess the efficiency of your existing doors and windows and make appropriate recommendations from simple weatherization to complete replacement. Forced air systems often pressurize some rooms and depressurize others. This pressure imbalance can literally drive air into and out of the home. GB3 uses sophisticated manometers to locate and quantify any problem areas. In many buildings in Boulder, leaks in the duct systems can loose up to 30% of all conditioned air! GB3 tests all ducts to locate and quantify any problems in your system. Many gas pipes develop leaks over time. GB3 uses a sophisticated gas "sniffer" to locate any problem pipes. Once all testing is complete, our auditor will tour your Boulder building and review any findings with you. After we have conducted the audit, you will receive a comprehensive Home Performance Report within five business days. The report will contain a complete analysis of the relevant tests conducted in your home, a prioritized list of improvement recommendations, and a bid for completing all work. 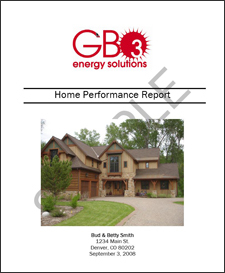 Complete this form and receive a FREE Sample GB3 Home Performance Report.